When The Kid was away at college, my mom sent our little scholar a box of her famous frosted sugar cookies. My generous child offered them to friends, but there were no takers—it was culinary school, and these were just boring sugar cookies from some random grandmother in North Carolina. Eventually, one person had one. Then another person, then word got out about these amazing cookies. Long after they were nothing but a memory, chef-instructors would approach The Kid, and ask if there any cookies left. Like my own mom, another mom I know makes an epic frosted sugar cookie. My mom’s cookies are shockingly delicious, but definitely not fancy. Mama Cat’s are crispy, delicate, and also, shockingly delicious, but they are kind of fancy. Her son Chef Chrissie, makes them for very special dates. He also must use them in some type business negotiations, because he calls them his “never-fail deal closers”. If they were shoes, Mom’s would be a classic pair of Doc Martin boots; good-looking, super comfortable classics that you could wear every day, all day. Mama Cat’s would be Christian Louboutin’s; elegant, exquisite, and for very special occasions. As good as the cookie is, the frosting, this wonderful vanilla fudge, is almost better. And, if you let the frosting boil for about five minutes before adding the confectioner’s sugar, it will set up much thicker, and can be placed into mini muffin papers, with a light sprinkling of jimmies. They transform into addictive little vanilla-fudge candies. The secret to these cookies is the dough and how it’s rolled. If the dough gets warm, they won’t work, so unless you work really, really, fast, you will need to refrigerate it every so often while working with it, and before baking. And these need to be rolled super thin—like 1/8-inch thin. Don’t get lazy here, thinness makes a huge difference. You want the finished product thin and crispy as a cracker. These cookies are the perfect accompaniment for tea with the mother-in-law or to grease any particularly squeaky wheels you might have in your life. They are chic little treats that would look appropriate at a patisserie in Paris, but also just right for eating in your pajamas while watching one of those “real” housewives shows. Combine all ingredients. Split dough into two disks and refrigerate for at least one hour. Roll cookie dough out very thin and cut into shapes. Bake on parchment lined baking sheet at 400 degrees for about six minutes. Cool on racks until completely cool. Makes 3-4 dozen cookies, depending on size and shape. Heat ingredients in a saucepan until it boils. Let it cool slightly, and mix in 1 & 3/4 -2 cups of sifted powdered sugar, a pinch of salt and 2 teaspoons vanilla. 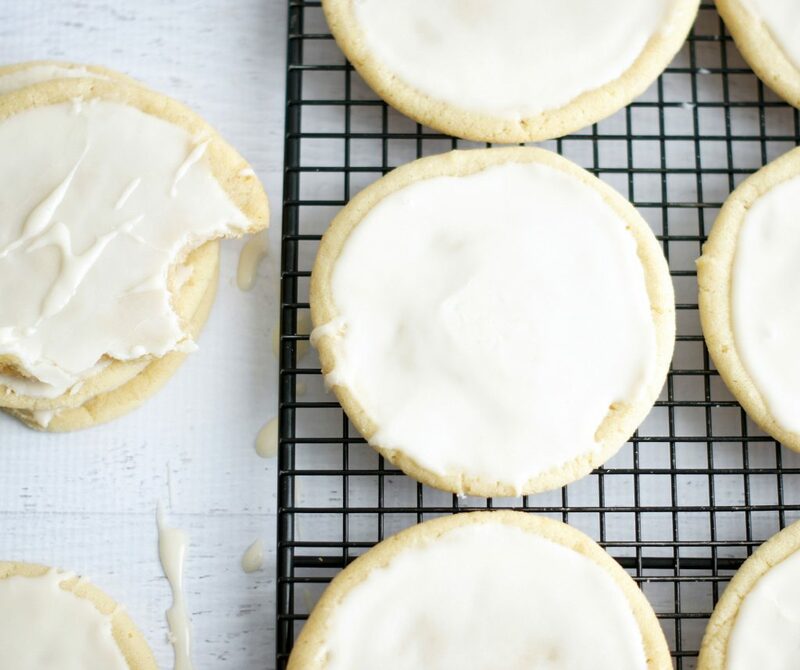 Spread a thin layer of the warm icing on cookies and let cool and set. If you take your time, and use care, you’ll have an elegant, delicious confection to impress. They’re great to have in your back pocket (but not literally—they’d crumble and stain your drawers). Stained drawers. See what I did there?